If you follow me on Instagram or Snapchat, you'll be well aware that I visited Milan a couple of weeks ago with my best friend, Beth. The trip was a joint present four our 21st birthdays - better than a soon-to-be-forgotten-about material present, eh? We both loved our short stay in the city, where we lived in a small Air Bnb studio and ate copious amounts of gelato. 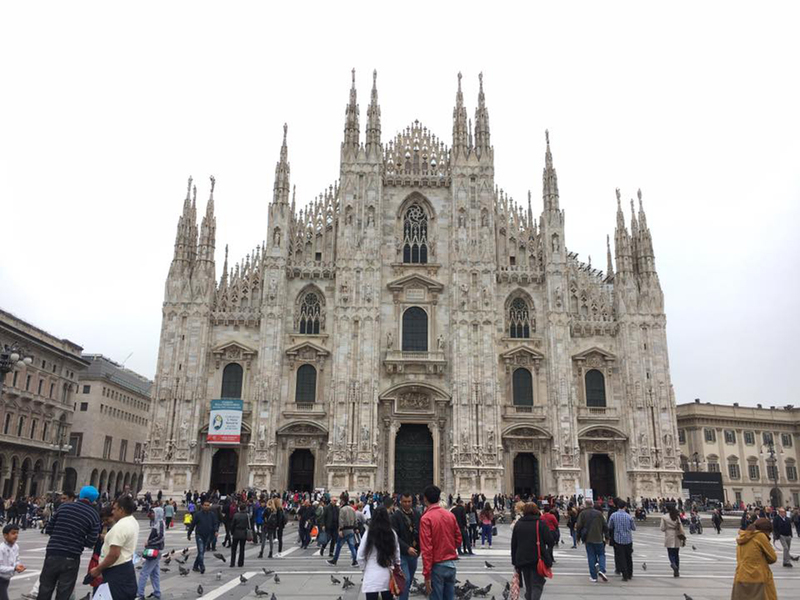 We also learned a couple of tips and tricks along the way which I'd like to share with anyone else who's thinking of heading to Milan any time soon. Seeing the Duomo is usually the first thing on most 'things to do in Milan' lists, but there's a good reason for this. Now I come from a beautiful city with not one but two cathedrals, so I know my pretty buildings, but the Duomo in Milan is seriously one of the most impressive buildings in the whole world. It's big, it's gothic, and you can even go inside, but if you're planning on doing so, remember to keep your shoulders and knees covered and if you have any sharp items in your bag (not sure why you would, but in case you do), armed soldiers will search you as you go in, which can seem a bit scary if you're not used to it like me! Our Air Bnb apartment was about a 45 minute walk away from the Duomo in the city centre, which would have taken us about 20 minutes using the ATM (their version of the tube, which you can download a really handy app for), but more often than not, we walked, no matter how tired our feet were. If you can, try to walk more than you take the train, because around every corner you'll find beautiful buildings, and lots of dogs, which is always a great thing. 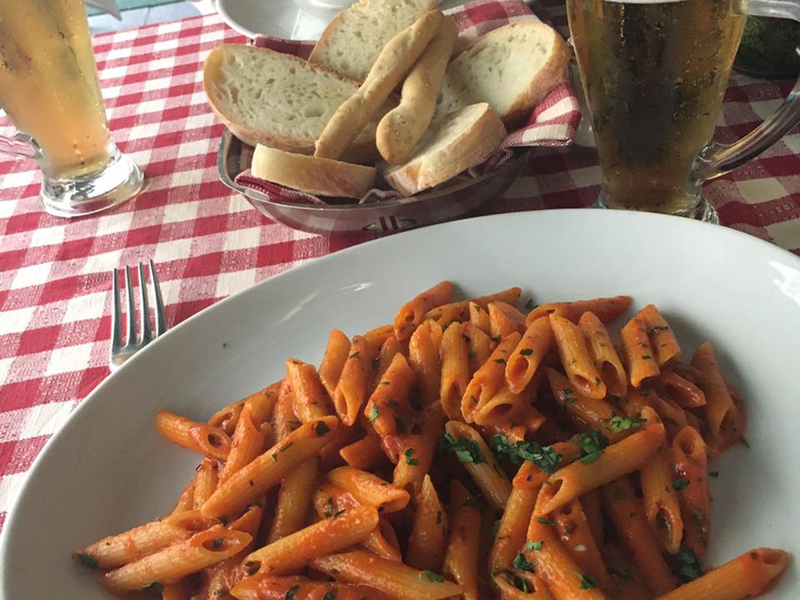 It's true what they say, Italians know their food. This right here was the best pasta I've ever had in my entire life, which says a lot as I eat pasta on almost a daily basis. After walking for hours on end we ended up in the tourist-type restaurants near the major tourist locations, but even their tourist restaurants are a hundred times better than those in the UK, especially their penne arriabiatta, damn. Make sure you savour it while you're there, because Sainsbury's jar of pasta sauce is nothing in comparison once you get home. In fact, whilst you're in duty free you can pick up some amazing spices, pasta, cheeses and olive oil, so make the most of it! Milan may be a fashion capital, but that comes with a hefty price tag. You can wander past Celine, McQueen, Tom Ford and drool over the window displays all you want, but this is serious business. They don't just let anybody into a lot of the shops, unless you look the part (this is terrible, I know, but it happens). I definitely wasn't looking the part during my trip but with the biggest Zara I've ever seen in my life and with Italy being the home of Brandy Melville, my shopping cravings were satisfied. FYI, this Zara was by the long line of shops behind the Duomo, opposite Sephora. 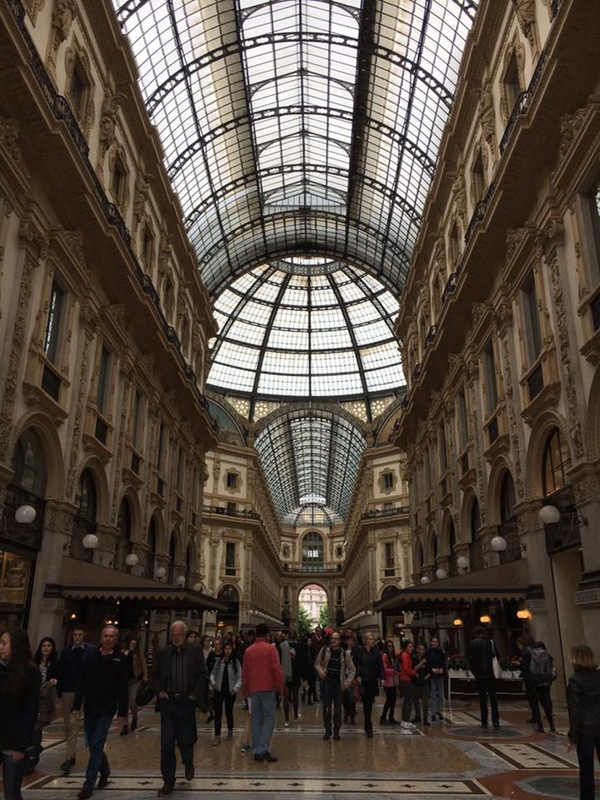 Nearby, just off the piazza outside the Duomo, you can find Galleria Vittorio Emanuele, which is actual heaven on Earth. A truly religious experience, with Prada, Gucci, Versace, the most stunning architecture and priceless paintings located above the shop doors, so make sure to keep your eyes peeled, just look at the architecture in this building! It's a shame I would have had to take out a loan to buy a pair of shoes in there though. This architecture is a little different to the Gallerie Vittorio Emanuele, but interesting none the less. Now I'm not much of a football fan, I keep up with Liverpool occasionally but that's about it, but I actually enjoyed our tour of the San Siro stadium. Chances are someone on your trip will be a football fanatic, and well, someone else may be less than enthused, but if you book a tour of the stadium (which is advised, we had to queue for a while in the heat and wrestle our way to the ticket booth to get the last tickets, as the tours stop at noon on match days), chances are you'll both enjoy the trip, even just a little. 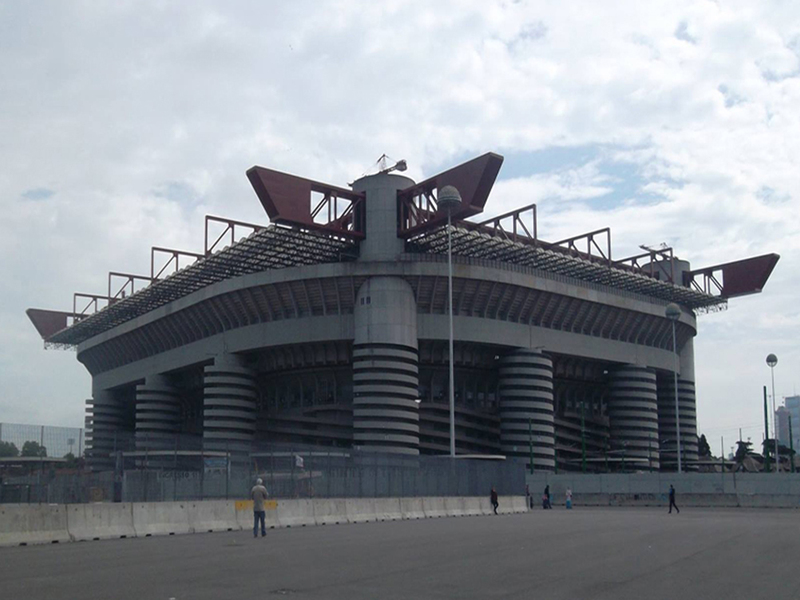 On the tour, you're able to sit in the seats in both AC Milan and Inter Milan's changing rooms, look in the teams' joint museum, get to sit in the best seats in the house as well as the dug out, which even I found pretty cool. Every church you stumble across, make sure to stop for a second and admire the architecture, and if you have your shoulders and knees covered, maybe even pop inside to explore some more. With the weather being in the mid-twenties during our trip, and being from grey old UK we were definitely dressed for summer in skirts and t-shirts, and knew we wouldn't be welcome inside a lot of churches, so we didn't get to fully explore them, although we did pop in the gardens of the Santa Maria delle Grazie. If you take the back entrance, there's a small, serene garden to explore that leads into the gift shop, which we were welcomed into even dressed the way we were. This is also the place where you'll find the famous Last Supper painting, but tickets are like gold dust, so make sure to book well in advance. Side note on dress codes: despite Milan being a major fashion capital, we found it to be surprisingly conservative, so if dressed for summer like we were, expect a bit of side eye from some of the locals outside of the usual tourist-heavy areas. Ironic coming from a fashion capital! Sforza castle is officially one of my favourite places in the whole world. This picture was taken at one end of the gardens, in front of Porta Sempione, and just behind the camera are gardens as far as the eye can see, leading up to Sforza castle. The gardens are filled with sunbathers, dogs and performers, we even saw people practicing their tight rope walking amongst some trees, not your average thing to find outside a castle. You can take your time strolling through the gardens, even stopping to take a nap on a bench as many people do, or hire a bike to cycle up to the castle itself. When crossing the drawbridge, make sure to look at the walls and grass beneath you, we found lizards and cats resting in the shade. Now I'm not sure if this happens all the time, but both times we visited (it was that good), there was a kind of artisan fair going on, where we got to taste freshly baked bread, giant wheels of cheese and buy plenty of olive oil and wine. And if you need to take a break in the shade, for €5 you can see work by Michael Angelo and Leonardo da Vinci inside, making Sforza castle well worth a visit. In every nook and cranny and around every little corner, you'll find beautiful architecture, delicious gelato and things you never would have discovered going from tourist attraction to tourist attraction on a strict schedule. As we began to wander back to our Air Bnb apartment one evening, we saw a long queue for gelato and thought we'd see what all the fuss was about. 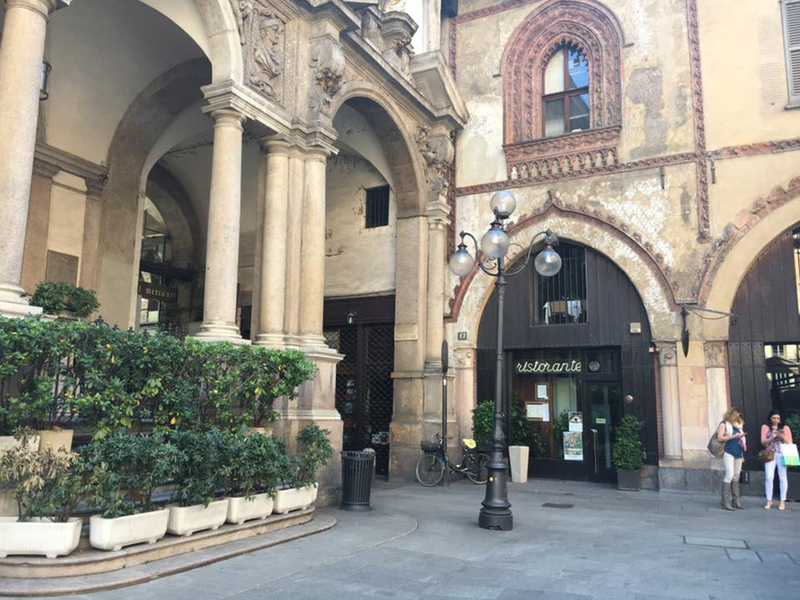 As we were in the queue our eyes began to wander, and we found ourselves in Piazza Mercanti, a spot we'd tried and failed to find the day before. This place was only small, but one of the most beautiful places we'd ever seen. 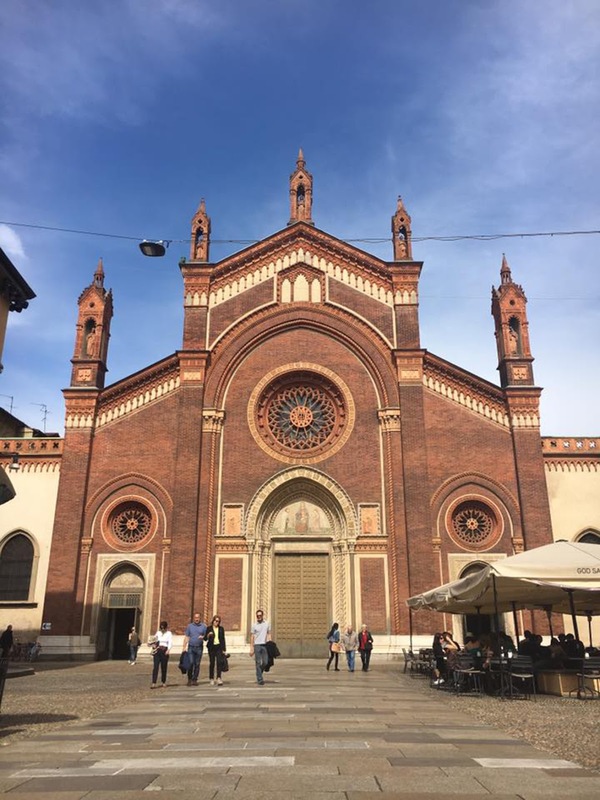 Also on our wanders, we stumbled across famous churches, cool sculptures and even a small artist's studio, so whilst wandering the streets, remember to take your time, look around you, and bask in the beauty that is Milano. I hope you enjoyed my first travel post! I'm heading to Tokyo later this year, so make sure to follow me on Bloglovin' if you're interested in reading about that. If you have any blog posts about your travels, please leave your link in the comments, I'd love to have a read. I have to stop procrastinating and do my Milan trip post as well ! yours is awesome ha !! Haha I know I put mine off for ages! Hope you enjoyed your trip! 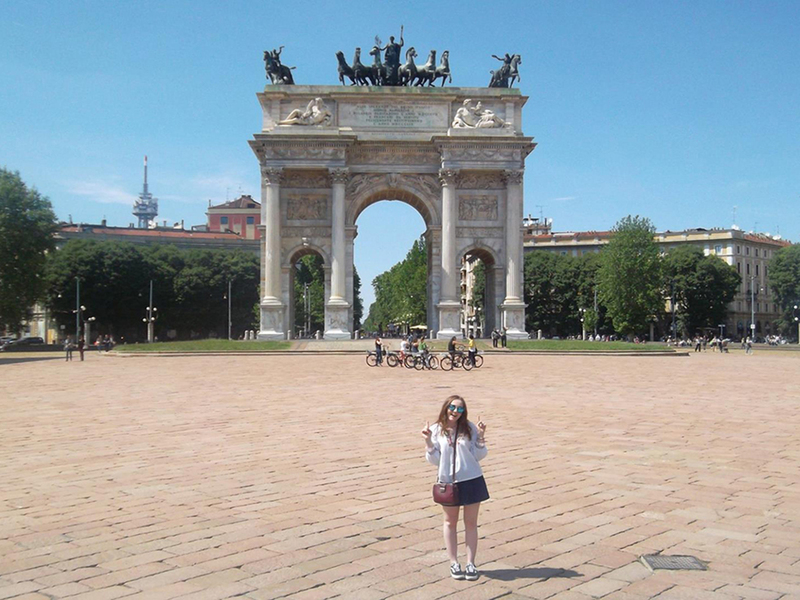 You look so cute and teeny next to Porta Sempione haha, Milan looks beautiful - looks like you had a great time! I know right! I understand this happens in most cities but the shopping felt almost hostile here.. One day I'll be able to afford Celine and prove them wrong! I adore Milan! Your pictures are amazing and it looks that you had a lot of fun there. Thank you very much, we did! I'm desperate to explore more of Italy now.. next up Venice or Florence! This post brings back so many memories! 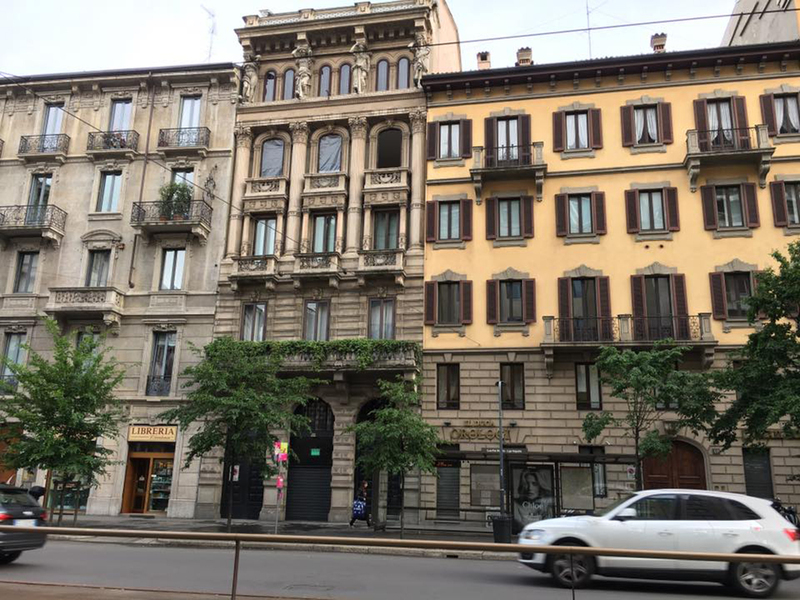 I visited Milan once and I was there long enough to fall in love with the city. Aw I'm glad! It's beautiful, would definitely like to see more of Italy now! Your photos are beautiful! It sounds like a lovely trip! It looks like an amazing trip, the food looks delicious! I would love to visit Milan, more so after seeing this! I visited Milan two years ago! Isn't it beautiful?! The Duomo looked majestic! Hope you had fun!